William John Hennessy was an Irish born artist, who worked first in America and then later in England and France. He was born in Co Kilkenny in Ireland in 1839, but when his father John Hennessy, politically active in the Young Ireland movement, was forced to leave the country in 1848 William John would travel with his mother and brother to join him in New York where he had settled. William John Hennessy would remain in America until 1870 and it was in America that he underwent his artistic training. He was accepted into the National Academy of Design in New York in 1854, and exhibited his first works there. Following his studies he found employment as an illustrator and engraver initially, working particularly for Harper’s Weekly and Leslie’s Illustrated. 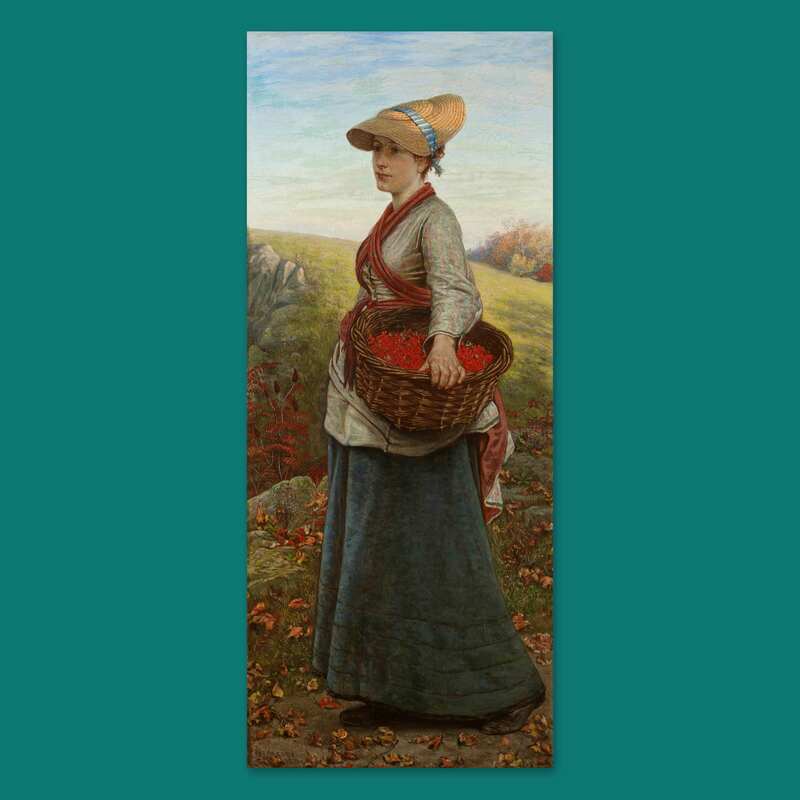 But in the 1860’s he began to develop as a genre painter as well, painting figures in both oil and watercolour in indoor and outdoor settings. In 1870 he moved to England and began showing at the Royal Academy and elsewhere and by 1875 he had moved to France, renting a manor near Honfleur. Here he found much inspiration in the Calvados region of Normandy, painting the field and orchard workers of the area. By 1893 he was back in England living first in Brighton and later in the Sussex countryside. He continued to exhibit widely in England, showing in London, Manchester, Birmingham and Glasgow and also at a number of the exhibitions of the Royal Hibernian Academy in Dublin. But interestingly he never detached himself from his American roots either, sending works to the 1876 Centennial Exposition in Philadelphia, and to the annual exhibitions at the National Academy of Design from 1880 to 1882 and again in 1900. He died in Sussex in 1917. 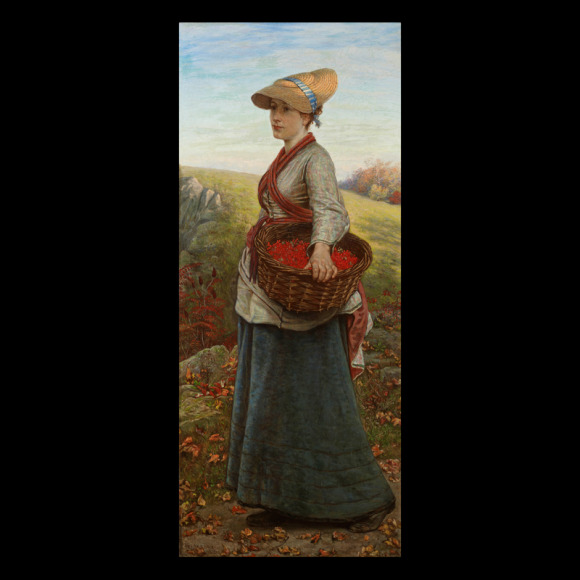 A New England Barberry Picker was one of Hennessy’s first Royal Academy exhibits (1871) when he arrived in England. With its American title it must be safe to assume that it was one of the last works he painted in the US before his emigration. The girl in the picture is shown collecting barberries, the fruit of the barberry plant (Berberis Vulgaris). This plant was popularly grown in New England as a hedging plant, with the flowers being used for yellow dye and the red and purple, slightly egg-shaped berries for jam. The strong reddish tinge to the landscape, so typical of a New England fall, again marks the setting out as unmistakeably American.